Staying in shape isn’t as difficult as it is time consuming. It takes commitment to get in shape. These 5 work outs are simple and very popular. They work out most muscles and help build up your arms, legs, back etc. Dumb bell lift is first exercise, this is usually a simple beginner routine. Works out glutes, legs, and back. First you Grab a dumbbell with both hands and hold it at arm’s length in front of hips. Then you bend at your hips and knees to lower the dumbbell to the floor. Then, pull torso back and up, thrust hips forward, and stand up with the kettle bell or dumb bell. Squeeze glutes as you go. Upper body push up is another simple beginner exercise to workout your arms, calves and shoulders. You push your hands upon an elevated area. Do 3 sets of 10 to 12 reps, resting 60 seconds between sets. You slowly lower your body onto the bench, then pause at the bottom right before you touch it. Push back up to start position as quick as possible. If you want to be more challenged repeat the steps wearing a weight vest. Split squat is a lower body workout. It works out your legs and glutes. You elevate your dont foot your feet should be 2 to 3 feet apart. You bend your front knee and lower your body slowly forward. You pause and push back up quickly. Do your reps and switch to the other side. Upper body chin up is an upper body (mainly arm) workout. First you loop an exercise band around the chin bar, grab the bar with an under hand grip and put your knees in the loop of the exercise band. Lower your body down and then return to the start position. Do the chin up by pulling your collarbone to the bar while pulling up you stick your chest out and squeeze your shoulder blades. If you want to try a more challenging work out take away the exercise band, that way your holding your whole body weight. Core dominant carry is the last workout and is simpler than the rest. 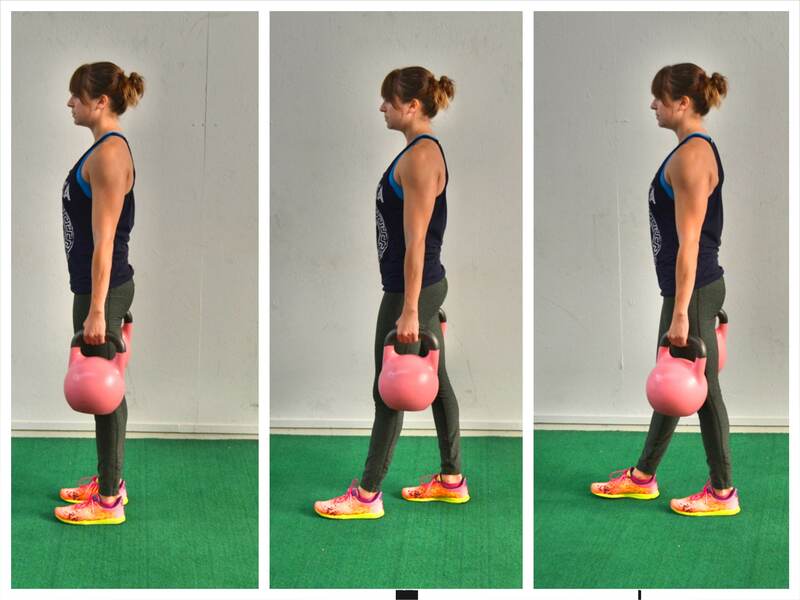 you hold a kettle bell in each hand stand up straight and walk forwards at a steady pace with both kettles to the side. If you want to try something harder you can hold kettle bells at shoulder height and repeat steps.